Between work, school, the blog, and sports, this summer is passing me by at an incredible rate. It's inconceivable that another month has passed us by, and that means that another month of dividends have arrived in my brokerage account. With that being said, it's time to examine my dividend income for the month of July. The trend of the first month of the quarter being my slowest in terms of total dividends received continues. 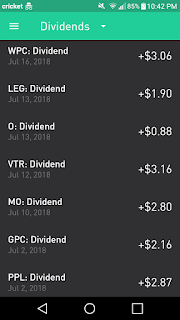 Overall, I received $16.83 in dividends from 7 companies in the month of July. Compared to a quarter ago, I received $10.69 in April of this year from 5 companies. That's a quarter over quarter (QOQ) growth rate of 57.4%! Besides the additions of PPL (PPL) and Ventas (VTR) that contributed $6.03 in additional income, I received a total quarterly dividend raise of $0.10 from Leggett and Platt (LEG) and a token $0.01 raise from WP Carey (WPC). Also, the diversification of the portfolio can be observed by noting that I didn't receive any hefty dividends from any one company this month, as I will be in the month of August from a few companies. 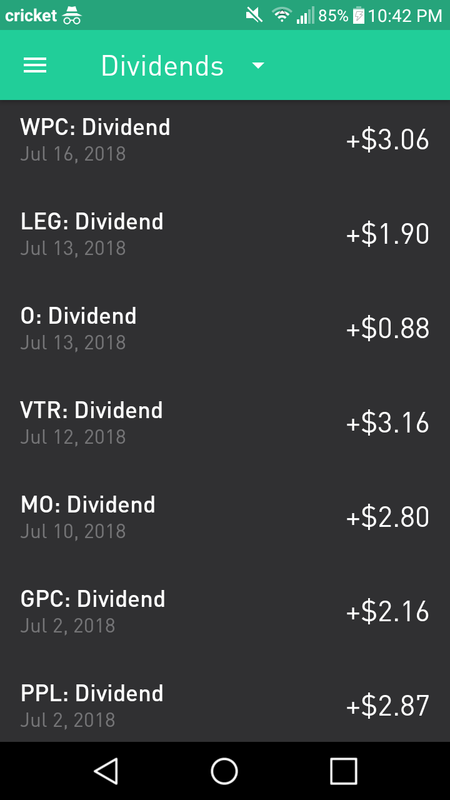 Although I won't be able to increase my dividend income at a clip near 57.4% again for the next year due to paying my way through the last year of undergrad to graduate with no debt, I do believe that my dividend income will continue to see impressive growth simply through the impact of dividend increases and dividend reinvestment. My dividend income should continue to see incredible growth in the end months of quarters (i.e. March, June, September, and December) because I'm still able to contribute 7% of my gross pay to my Simple IRA retirement plan through work, in addition to a 3% match from my employer. How was your July? How many companies paid dividends to you? What impact did your new additions to the portfolio have on your dividend income when compared to April? Looks like you are doing just fine with your portfolio. You are getting paid by some of the finest dividend paying stocks out there and with dividend growth, new buys and reinvesting your snowball will only accelerate over time. Just take a lot of patience. Keep up the good work. Thanks, Keith! You had quite an impressive July yourself. It's certainly easy to commit to DGI as the dividends continue to roll in despite market volatility. Thanks, D&H! DGI is absolutely the best method in my opinion. My dividend income won't grow quite as fast as it has been until I graduate next August due to only contributing to my retirement account and organic growth from dividend reinvestment/raises. The growth will really accelerate after college with fresh capital.